1. Please be sure you have already installed Icaros Desktop 1.3.1 onto your hard drive, either by installing Icaros Desktop 1.3.1 directly, or by updating to 1.3.1 an Icaros Desktop 1.3 installation. 2. 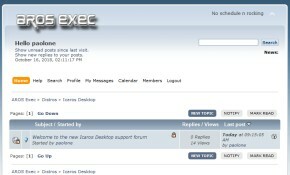 Download Icaros Desktop 1.3.1 patch 01 from our download section. Move it to your AROS machine if you have used a different computer to download it. Do not extract the files in the 7z archive. 4. Wait for all files being copied. When finished, you may decide to reboot the system, but it's not mandatory.